Some leaves flame out in a glorious explosion of color. Under the branches of gold and vermillion, others end their lives in a more modest manner. Edges take on a darker hue. 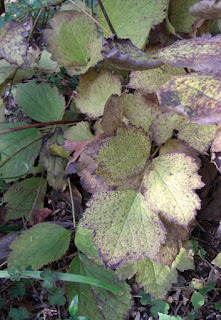 Greens become paler or turn into half-hearted greeny-yellows. Speckles spread in interesting formations. It's a much subtler transformation, but not without its own beauty. As you walk under the last of those brilliant autumn trees, don’t forget to look down and enjoy the quieter, more subtle show closer to the ground.